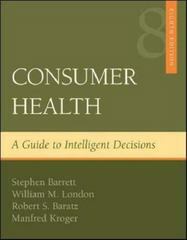 Consumer Health: A Guide To Intelligent Decisions 9 Edition The most comprehensive consumer health text available, Consumer Health: A Guide to Intelligent Decisions offers a panoramic view of the health marketplace. You’ll learn how to sharpen your critical consumer skills so you can distinguish valid health claims from those that are fraudulent or misleading. By offering science-based facts and guidelines, Consumer Health provides the tools you need to make smart decisions about health-care products and services for yourself and your family.